I am sure that some of you will be skeptic about this premise. I mean, how can we claim that body’s movements – gestures, postures, and expressions – represent our emotions more authentically than words? Well! The answer lies in the design of our brain. According to the concept of ‘Triune Brain’, formulated in 1960s by an American neuroscientist Paul D. MacLean, we actually have three brains, built over and around one another, in the course of evolution, during millions of years. Brain one is called Reptilian brain. It is the bottommost, at the centre, just above our spinal cord. This is a part whose structure is similar to the brains of birds and reptiles. It is attributed to the basic, housekeeping & survival functions. Due to its location, it is also called Brainstem. Brain two is called Mammalian brain. It is wrapped around brain one and its structure is similar to the brains of older mammals like dogs, cats, horses, and even rats. It supports functions related to emotions, behavior, motivation, memory etc. It is also called limbic system. Brain three is called Primatebrain. This structure is wrapped around brain two and its structure is conceptually similar to the brains of chimps etc. yet far more evolved than theirs. This is where our intelligence and other executive functions reside. It is called Cerebral cortex. These three brains work independently as well as interdependently to create the unique ‘human brain’. 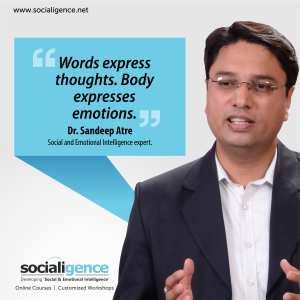 But what it has to do with our premise of ‘Words express thoughts…body expresses emotions’? Well! What is really interesting is that while our verbal behavior is guided more by cortex, our nonverbal behavior is guided more by limbic system and brainstem. Now, while cerebral cortex is more intelligent, deliberate and regulated, the deeper parts of the brain are more emotional, reactive and unregulated. As a result, our nonverbal behavior is less regulated and thus represents our emotional state more authentically. It is also beyond our conscious control and although our primate brain can exercise top-down control over it and suppress it, it still can’t curb the generation of that impulse. That’s why it is important to pay attention to nonverbal behavior as that is what helps you develop an understanding into someone’s emotional realities. And only that can facilitate a meaningful connection.